Donaldson Company (DCI) is an often overlooked Dividend Champion but after a recent pullback, due to lower sales & income, there is an opportunity to buy into this steady grower. DCI was often overlooked due to its low dividend yield (below 2%) but the recent pullback in share price has increased the yield to 2.34% and may be more tempting for your portfolio. DCI is a manufacturer of air & liquid filters with a diverse business operating in two segments, engine products and industrial products. Within those sectors they serve 23 different industries with no customer representing 10% or more of total sales which translates into a broad and diverse customer base. 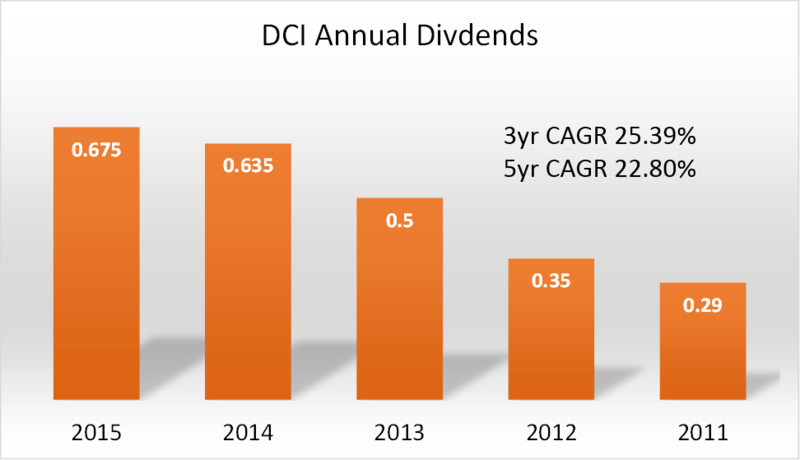 In regards to dividends, DCI has 29 consecutive years of dividend growth and looks to continue that streak into 2016 and beyond. DCI’s recently raised its quarterly dividend to 0.17 or 3% which is well below their traditional growth rates but opportunities exist to see a return to higher growth rates. Overall DCI has some declining financials but they still represent a conservatively managed company with significant profit margins. Net sales for 2015 were down 4% but the larger concern was a 20% drop in Net Income from $260M to $208M. The debt ratio of 0.57 had been steadily increasing over the last three years from 0.38 but is still manageable and respectable. Throughout DCI’s 29 year consecutive dividend growth run they have operated under the belief that if they invest steadily in themselves that everything else will fall into a place. It is a model that has continually paid off even in low earning years such as 2001, 2009 and 2010 and though history cannot predict the future it does give promise that DCI can overcome 2015’s dismal financial performance. In 2015 DCI continued its model of continually investing back into the company. The Capex to Depreciation ratio was 1.4 with capital expenditure spending of $94M significantly outpaced depreciation of $67M. Research and development costs were $60M and was followed up with $106M in acquisitions. With Capex, R&D, and acquisitions this represent a total of $193M being poured back into the company for future growth. Additionally, DCI invested $256M in stock buybacks increasing the overall investment towards future growth to $449M. DCI’s investments should add $10-$20M to 2016 net income and combined with the stock repurchase plan my dividend growth target is 9-12%. In regards to financials, I would like to see stock buybacks reduced by $100M and use that cash to shore up cash on hand to increase their current ratio from 1.84 to 2. I'd consider this a buying opportunity as long as the dividend yield stays above 2% and the company maintains internal investments into 2016.